Hyogo Daibutsu is a daibutsu, or a giant Buddha statue in Nofukuji Temple in Kobe, Hyogo Prefecture. This temple is known as a temple related to the famous samurai, Taira no Kiyomori (1118-1181), so there you can see a stone pagoda built for him, as well as Hyogo Daibutsu. Why was Hyogo Daibutsu built? In 1868, the revolution called Meiji Restoration (Japanese: Meiji Ishin) took place, and the government advocated the expulsion of Buddhism from Japan. Moreover, some years later, Christianity came to flourish in the area called “Foreign Settlement” in Kobe, and Buddhism was becoming in danger of decline. Finally, in 1891, many people from all sects of Buddhism cooperated to establish Hyogo Daibutsu, in order to protect Buddhism. Although there are different opinions about Nihon Sandai Daibutsu (three major daibutsu in Japan), I think I can say that Hyogo Daibutsu is one of the three major “traditional” daibutsu in Japan. Originally, Hyogo Daibutsu was known throughout the country as Kobe’s landmark for sailors, and it was considered as one of Nihon Sandai Daibutsu, along with the daibutsu in Nara and Kamakura. During the World War II, however, Hyogo Daibutsu was demolished in response to the Metal Collection Act in 1944. After the war, the chief priest of Nofukuji Temple at that time retrieved the remaining parts of Hyogo Daibutsu and kept them until 1991, when the present Hyogo Daibutsu was built. The old statue parts were mixed in the building materials for the new statue, and the old and new statues were considered to be one and the same. The chief priests of Todaiji (the temple that has the daibutsu in Nara) and Kotoku-in (the temple that has the daibutsu in Kamakura) officially recognized Hyogo Daibutsu as one of Nihon Sandai Daibutsu when they attended the ceremony to breathe life into the new daibutsu. By the way, the day of the ceremony, May 9th 1991, happened to be just 100 years later from the ceremony for the previous daibutsu. 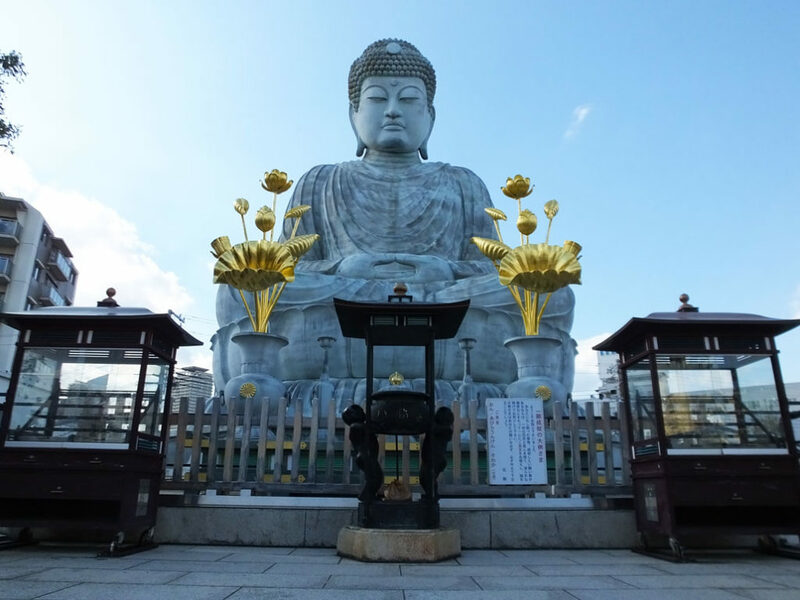 Hyogo Daibutsu stands about 18 meters tall, including the 7-meter-tall base. It is quite tall when it is taken into consideration that the daibutsu in Nara is about 18 meters tall, and the daibutsu in Kamakura is about 13 meters tall. It is believed that if you have a pure heart and pray to Hyogo Daibutsu, your wish will be fulfilled. If you want to pray, chant the mantra, “on abiraunken sowaka” 7 times in front of Hyogo Daibutsu.